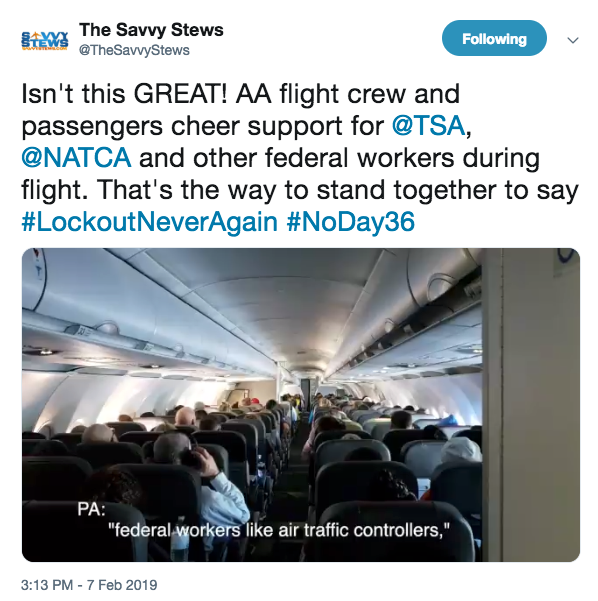 The Savvy Stews today posted a message from Flight Attendants and passengers to ATC and TSA: "Isn't this GREAT! AA flight crew and passengers cheer support for @AFGENational, @NATCA and other federal workers during flight. That's the way to stand together to say: #LockoutNeverAgain #NoDay36"
Ladies and gentlemen, may I have your attention for just one minute, please? Do we have your attention now? As Flight Attendants and Pilots, we rely on federal workers like air traffic controllers, TSA officers, FAA safety inspectors and many more to keep our skies safe and our flights moving. If they can't do their jobs, we can't do ours. It's been a stressful time recently for our federal partners. We want to show them how much we appreciate them. We're recording short videos of appreciation, and we'd love your help. Thank you! We know they’ll appreciate your support and we want you to know we’re going to make sure they can do their job so we can do ours and your travel isn’t interrupted. As we say to each other in aviation, let’s Fly Safe!